The sleek, aerodynamically designed Eco-Cycle is used for quick scouting missions throughout city streets or in the countryside. It has special all terrain tires so it can handle any type of roadway - from smooth highways to mountainous bike trails in remote areas. 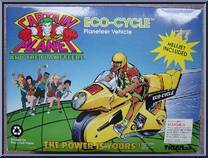 As with all the Planeteers' vehicles, the Eco-Cycle is solar powered and can store the sun's solar energy for extended periods. This is especially important if the Planeteers ever need to travel at night. Contribute pictures, update details or suggest corrections for Eco-Cycle . 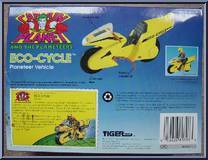 Write a review about Eco-Cycle .